With a wide array of sizes and configurations, AirClean Systems laboratory products offer flexibility and mobility without sacrificing safety or quality. State-of-the-art filters and electronic monitoring make AirClean Systems' operator protection products the right choice for today’s ever changing laboratory. If your application requires something other than a standard operator or process protection workstations, AirClean® Systems has a solution for you. Whether you require a metal free environment, a UV light for irradiation between samples, or operator and process protection, AirClean® Systems has the right product for your specific needs. 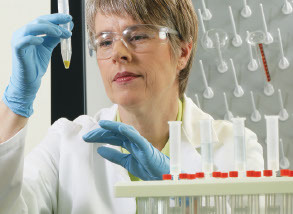 AirClean® Systems complete line of Process Protection products promote sample integrity. ISO 5 laminar flow clean benches and workstations are available in an array of sizes and configurations with UVITect™ monitoring of airflow and filter saturation. Both vertical and horizontal designs provide ISO 5 clean air through a combination of electrostatically charged pre-filtration and either HEPA or ULPA filtration to keep samples free of background or cross-contamination. PowderSafe™ enclosures are the solution to weighing of potent compounds and chemicals. PowderSafe™ ventilated enclosures offer both particulate and liquid chemical filtration capabilities. Engineered for safety and balance stability each PowderSafe™ balance enclosure is constructed from materials that offer exceptional durability as well as ease of cleaning. The PowderSafe™ enclosures range from balance enclosures to full scale large batch sampling enclosures. AirClean® Systems Robotic Safety enclosures are designed to protect either the process or the operator from fumes, vapors, or particulate. A full understanding of both equipment and user requirements allows AirClean® Systems to design and delivery a safe and effective solution. AirClean Systems Endoscopy and Ultrasound soaking stations provide superior occupational safety while allowing for ample work area to complete high-level disinfection of scopes and probes. AirClean Systems manufactures HEPA filtered endoscope and ultrasound probe storage cabinets that securely hang the scope or probe between procedures. AirClean Systems DrySafe™ and CyanoSafe™ are engineered solutions to protect the law enforcement professional while ensure effective and accurate evidence processing.